In the weeks since Google launched their "Instant Search" feature, the reaction in the SEO world has gone from panic to indifference. At first, there was a rash of "SEO IS DEAD" obituaries, but now that the actual data is building up, it turns out that Google instant has not radically changed anything -- not even Google search! One of the first bloggers out the gate with real numbers is Nathan Safran from Conductor, who concludes that the impact has been..."Not Much." Google themselves have pointed out repeatedly that the actual PageRank algorithm they're using to create the results pages we see has not been changed, at all. So as the hype dies down and the numbers start coming in, what effect will Google Instant actually have on your business? The short answer is very little effect indeed...and even that won't be clear for months. In the meantime, here's the five most important points we can make about Google Instant. 1. Google = Still a "Search Engine." Remember, despite all the hype leading up to the event and the 10,000 blogs that have been written about this new feature, the actual goals and benchmarks involved are very modest. 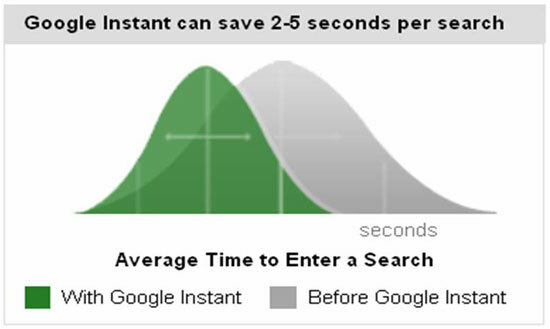 Even Google's own sales pitch is pretty under-whelming, claiming that Instant "can save 2-5 seconds per search." That's not exactly changing the world, and that's definitely not enough to render SEO useless. Here's the bottom line: odds are very strong that you will not have to change a single thing about your existing SEO strategies. And that's good news, right? 2. Bing vs. Yahoo. One of the most important facts getting overlooked is one that Google would very much like us all to forget. There's two other major search engines, with growing market share, who are both targeting Google's near-monopoly. Google's outspoken CEO Eric Schmidt said that "Bing is Google's Main Threat" recently, saying they were "a well-run, highly competitive search engine." More importantly, he said that Google does not consider Apple or Facebook to be a threat, which indicates that Google has no intentions of moving beyond search. SEARCH BY NUMBERS: As a side note, here's some hard data. Google's "near-monopoly" is actually a 65.1% market share as of August 2010. Bing has 13.9% and Yahoo has 13.1% -- expect to see Yahoo's share fall further, because their search engine results are now powered by...Bing. 3. "Wow, This is Annoying." In the days since Google Instant was rolled out, we've been hearing from an awful lot of people who turned it off more or less immediately. I am one of them. The general consensus is that the rapidly flickering changes were distracting, and that Google users already have a very clear idea of what they want to find and don't need any assistance. Even if that assistance comes from the most powerful Artificial Intelligence code in the known Universe. Most SEO experts (as opposed to SEO bloggers) have adopted a "Wait and See" policy, and they're most interested in seeing figures on how many Google users have turned off the Instant feature in the first month. As Michael Gray puts it, "it's not something that solves a problem I hear people complain about." "...when you type "life i", since "life insurance" is the most popular suggested phrase that matches "life i" it shows the results for the full phrase "life insurance." Google does not populate the search results with what's best optimized for the fragment "life i." So you don't have to run out and optimize your site for "life i" in an effort to have your site show up first when a user typing "life i" is looking for "life insurance." Google is still showing the results best optimized for "life insurance", not "life i." This is a non-issue, in other words. A lot of SEO experts live to make things more complicated than they have to be, because confused clients are easy to over-charge. Don't let it happen to you. Letter Optimization and Keyword Fragments are buzzwords without real meaning -- the basic rules of the search engine game have not changed. What's Your Call? Do you think you need to change any of your strategies as a result of this new technology? Are you using Google Instant or have you turned it off? Most importantly -- do you have any questions we didn't address here?